April 8, 1960 The Student Nonviolent Coordinating Committee (SNCC), one of the principal organizations of the Civil Rights Movement, was founded after a series of student meetings led by Ella Baker at Shaw University in Raleigh, North Carolina. Future leaders attending those meetings included Stokely Carmichael, Julian Bond, Diane Nash, John Lewis, James Bevel, and Marion Barry, who served as the first chairman of SNCC. SNCC was primarily focused on voter registration in the South and in 1963 conducted the Freedom Ballot in Mississippi. In 1964, they conducted the Mississippi Summer Project to organize the Mississippi Freedom Democratic Party to win seats at the 1964 Democratic National Convention. SNCC also established Freedom Schools to teach children to read and to educate them to stand up for their rights. 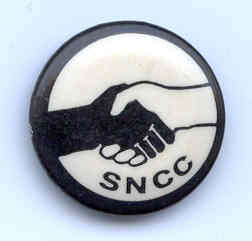 Although still active in some cities, SNCC largely disappeared in the early 1970s.